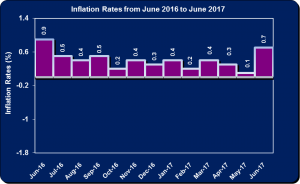 The inflation rate for the month June 2017 was 0.7 %, following an upward movement of 0.1% in May 2017. The movement was credited to a 1.1% increase in the division ‘Food, Non-Alcoholic Beverages’ which was impacted by flood rains in May. The division ‘Transport’ moved up by 0.4%, while the ‘Housing, Water, Electricity, Gas and Other Fuels’ increased by 0.4%. The ‘Recreation and Culture’ and ‘Restaurants and Accommodations Services’ recorded their largest movements for the year with a 0.4% and 0.6% increase year to date. The calendar year-to-date inflation rate was 2.1%, the point-to-point 4.4% and the fiscal year-to-date 1.1%. The ‘Food and Non-Alcoholic Beverages’ division reported a 1.1% increase for June, relative to 0.1% movement in May 2017, this is the highest monthly movement in the division for the calendar year. Within the division the group ‘Food’ rose 1.1%, while ‘Non-Alcoholic Beverages and Tobacco’ increased by 0.1%. The increase in the price of ‘Food’ was due to increase a 3.7% increase in the class ‘Vegetable and Starchy Foods.’ From the group ‘Non-Alcoholic Beverages’ the classes ‘Coffee, Tea and Cocoa’ and ‘Mineral Waters, Soft Drinks Fruit and Vegetable Juices rose by 0.3% and 0.1% respectively. The ‘Alcoholic Beverages and Tobacco’ division recorded an increase of 0.1%. This was significant lower than the 1.6% movement that was recorded from May 2017. On the other hand the index for ‘Clothing and Footwear’ went up by 0.2% for June this was due to an increase in the prices of footwear. The ‘Transport’ division rose by 0.2% in May 2017. This was as a result of the increase in the price of gasoline. Furthermore, the division ‘Recreation and Culture ‘recorded its highest monthly movement for the year, a 0.4% increase for June 2017. This was due to an increase in the cost of cable television services. ‘Restaurants and Accommodation Services’ division registered its largest movement for the year of 0.6%, due mainly to increases in the price of meals consumed away from home. The ’Miscellaneous Goods and Services’ division, as in the previous month, recorded a 0.1% increase in its index for June 2017. This was due to the increase in the prices of personal care and personal effects products.